The MacArthur Foundation named Dr. Lorenz Studer a 2015 MacArthur Fellow. A Founding member of NYSCF’s Medical Advisory Board, Dr. Studer served on inaugural juries of NYSCF Innovator postdoctoral fellows program and NYSCF-Robertson Investigator programs. Additionally, three NYSCF-Druckenmiller Fellows have trained in Dr. Stuber’s lab. He has helped shape the future of stem cell research—guiding and granting early career scientists awards for their efforts and potential, while pushing forward with the most innovative research. As a MacArthur ‘Genius’ Dr. Studer’s incredible work lifts the entire field of stem cell research bringing international attention and support toward realizing the potential of regenerative medicine. Dr. Studer’s research focuses on neurodegenerative diseases such as ALS and Parkinson’s. He takes advantage of human pluripotent stem cells to make neurons to model and treat these deleterious diseases in his laboratory. His research is concerned with directing pluripotent cells to differentiate and mature into specific types of neuronal cells. In this pursuit, he has discovered how to speed up the aging process of cells so his lab can study neurons at the age most relevant to disease and potential drug discovery. 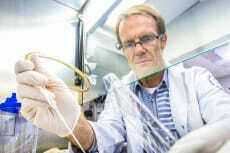 Currently, he is preparing for clinical trials to transplant lab-made dopaminergic neurons, brain cells lost in Parkinson’s disease, into the brains of Parkinson’s patients. He will moderate a panel at NYSCF’s Tenth Annual Translation Stem Cell Research Conference in October.